As bad as things may seem politically these days, there are still light-hearted events taking place on Capitol Hill. Office Dogs are a welcomed fixture in the halls of the House and Senate, and have been for some time. On Monday, Representative Curbelo (R-FL) hosted a holiday pup party to help bring people together around a common interest: dogs. I photographed Riggins (Santa's Helper, left), Curbelo's office dog, for my Office Dogs of Capitol Hill last summer. Riggins and his politically-driven pack of pups work to lighten the atmosphere of an otherwise highly stressful, dog-eat-dog workplace. 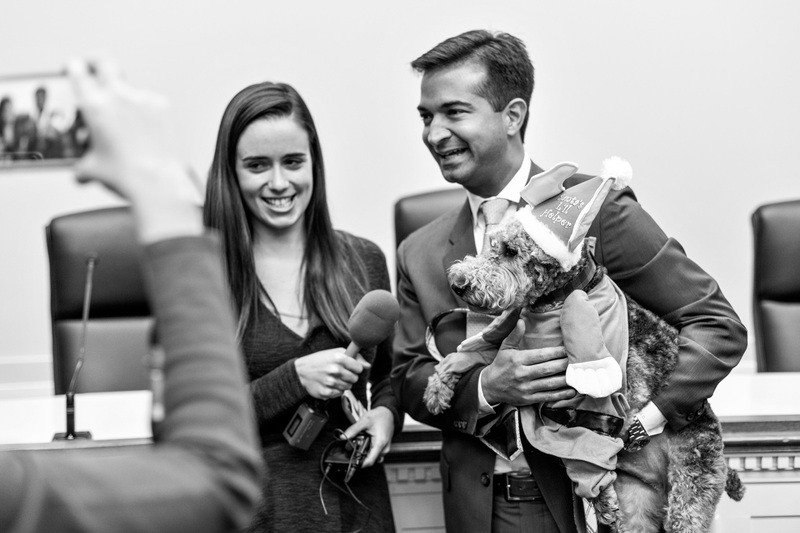 Reporters from Roll Call interview Rep. Carlos Curbelo and his staff's office dog, Riggins, about the first annual BiPAWtisan Holiday Party in the House of Representatives.